Brand: Very Best blades you can buy! 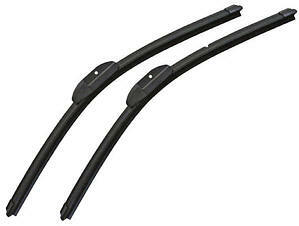 Kit includes set of two complete Ultra High Performance "Bosch Excel +" Wiper Arms and High Tech rubber Blades. Bosch Excel+ Wiper Blades clean windshields better and last longer than ever before. This ultra performance windshield wiper blade features an exclusive dual rubber compound with a fully-enclosed metal tension spring, housed in an aerodynamic steel frame. The result is windshield wiper blades with less streaking and unmatched resistance to wear from weather and corrosive elements. And with the exclusive Bosch DirectConnect™ one-step system, installation is quick and easy. Exclusive dual rubber compound Flexible soft layer reduces chatter. Hard wiping edge for superior wiping performance and longer life. DirectConnect™ one-step installation system Easy installation with no adapters required for over 90% of vehicle applications. Exclusive fully-enclosed metal tension spring Applies direct pressure for reduced streaking. Heavy gauge aerodynamic all-steel frame Maintains blade contact at all speeds. Exclusive zinc dichromate primer Delivers superior corrosion resistance. 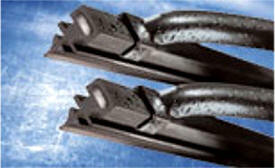 Duraflex One piece style wiper blade provides superior wipe in any weather. Unique adapter system provides replacement for conventional blades as well as factory installed flat blades. Designed not streak. Includes two 16" blades for right and left side.